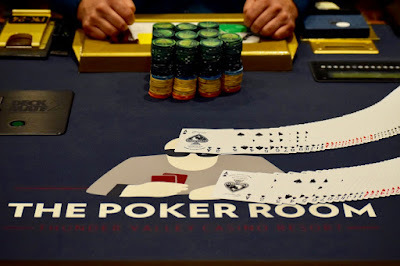 Registration has closed on the first of three starting flights in the $500,000 Guarantee @WPTDeepStacks $1,100 MainE vent and the board shows 100 entries. Play continues tonight until the end of Level 15 at 11:45pm or when down to 15 entries, aka 15 percent of the starting field - whatever comes first. Tomorrow and Saturday play under the same time schedule for flights 1B and 1C - Noon start, 6:30pm dinner, registration close 7:30pm and end-of-night at 11:45pm.